When I think of bees I want to run in the other direction. All I can think of is the possibility of that teeny tiny creature touching me and stinging me. 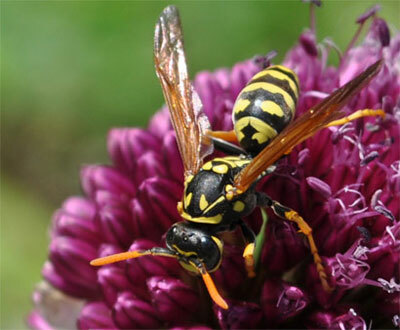 The fact is most of the stings come from yellow jackets, not bees. They look similar but they are very different insects. And bees are an essential part of the process of getting fruits and vegetables to our table. Honeybees have relatively plump and fuzzy bodies. Their hind legs are flattened, and you'll often see yellow pollen attached. Bumblebees are much larger, plumper and fuzzier than honeybees. Yellow jackets have a smooth, bright yellow and black body with a well-defined waist and thin legs and they are VERY aggressive and each one can sting multiple times. In spring and early summer, yellow jackets are carnivores, feeding mostly on insects to provide protein to developing larvae in their colony. As the season progresses, their diet changes to include more sugars and they begin hanging out near garbage cans. Yellow jackets nest underground in rodent burrows. By late summer, a colony may contain thousands of individuals that will aggressively defend their nests from intruders. By contrast, Honeybees nest in cavities, such as hollowed out tree trunks (or in beekeepers' boxes). They are very gentle and sting only if stepped on or swatted. They can only sting once and after they sting, they die. So they only sting as a last resort to defend their nest. Bees are our friends and provide an essential part of the food chain, providing consumers with amazing crops. They are essential to the process of pollinating fruits, nuts, berries, vegetables and field crops. I found this out the hard way one year when I had a large garden and planted two - yes only 2 - corn plants. The two plants was not worth the effort, you need rows and rows of corn and bees for the cross pollination. Otherwise- guess what – no corn! According to some recent studies, honeybees are actually in trouble, due to the use of certain insecticides. Research is being done to figure out the causes and solutions. You know those bee guys you see in protective suits? My hats are off to them. I think they are incredibly brave because they do work so necessary. I mean without those bees, we wouldn’t have the foods we love to eat. I have a cousin in Argentina who has a bee farm. When he told us, I thought he was nuts. I mean why? 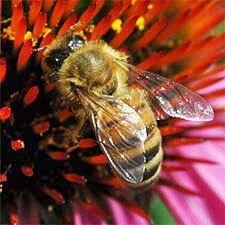 But he had a love affair with the bees and produced gallons and gallons of amazing organic honey from the bees annually. So when you eat squash, watermelon, pumpkin, nectarines, olives, macadamia nuts, almonds, citrus fruits, peaches, prunes, raspberries, strawberries, cranberries, grapes, kiwi, cherries, blueberries, apricots, apples, avocadoes, asparagus, cantaloupe, carrots (really? It’s a root vegetable), cauliflower, broccoli, celery, cucumbers, honeydew, and onions – remember our friends the bees and those guys wearing the protective suits. We may not want the bees near us humans, but we sure want them near the crops so we have the veggies and fruit we love to eat at our table. And that organic cotton you love to wear? Thank the bees.